Learn how to play Cuarenta and impress your Ecuadorian friends. 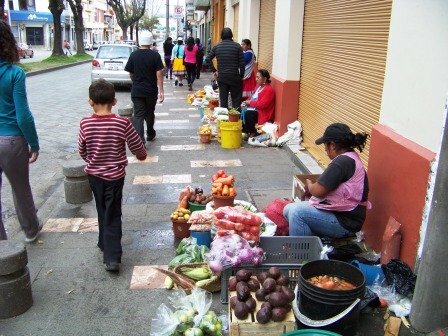 This card game is a favorite among young and old and is the official card game of Ecuador. My husband's family can sit around afternoon after afternoon playing. And it's fun! I'm sure variations exist from place to place and family to family, but this is how we play. To play you need two or four players. The object of the game is to get 40 points...thus the name "Cuarenta" which is Spanish for 40. You need a standard deck of playing cards with the Jokers, eights, nines and tens removed. You will use these removed cards to keep track of the points. Some people also use matchsticks to track points. When playing with four players you are partnered with the person across from you making two teams. Often when playing in teams one person on each team will keep all cards picked up by both teammates, which leads to some card throwing across the table. The dealer deals five cards per person. 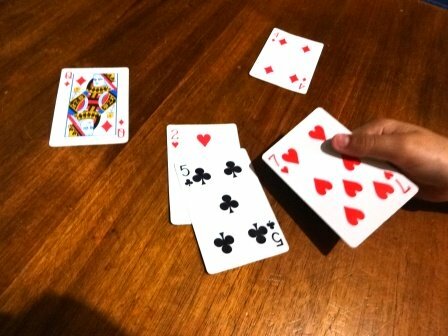 Note on dealing: It is very important to deal each person their five cards all at once instead of going around the table. So player one gets the top five cards of the deck, player two gets the next five, etc. The player to the right of the dealer goes first. On your turn, play one card from your hand. You get points for picking up the card discarded on the turn immediately before yours. If you are second to play and player one throws a three and you have a three in your hand, pick up the three and start a pile in front of you. This is called a "caida" and is worth two points. A caida is only scored when you lay the same card as the person before you. You also get two points for picking up the last card on the table. This is called a "limpia." We play that if you get a "caida" and a "limpia" together, you score four points. Apparently some people play that you only can score one or the other. It will depend on who you are playing with. Cards that you pick up that were not laid immediately before your turn or in addition to your "caida" card do not score points. 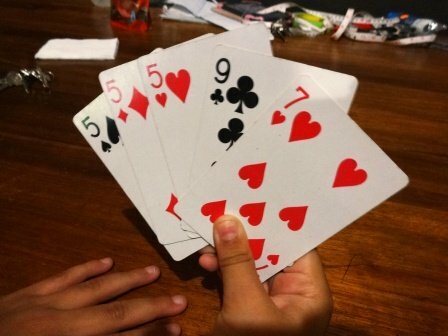 Once everyone has played their five cards, the dealer will deal another round of five cards. Rounds continue until all the card have been played. There will often be some cards left on the table. When all cards have been played count your cards. If playing with partners, count your partners cards together with yours. The player(s) that have more than 19 cards get extra points. Six points for the first card after 19 and one point for each card after that. So if you have 21 cards you get seven extra points. Since points are only counted by twos, round up to eight points. 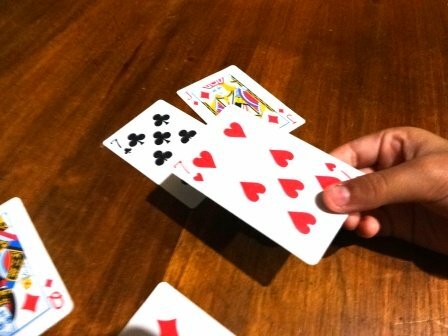 If no one has reached 40 points, the dealer passes the deck to the next player. Cards are shuffled and a new round begins. Keep playing until some reaches 40 points. There are a few ways to pick up extra cards or get extra points when you play Cuarenta. 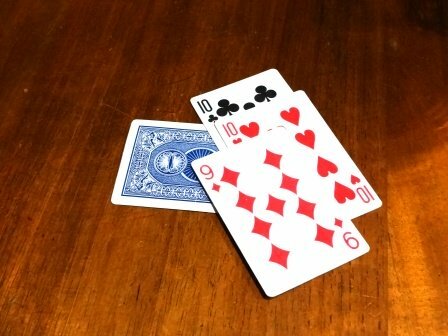 If you pick up a card -say a six- and there is also a seven on the table pick it up as well. There is no extra point for this, but it adds to your final card count. If you pick up an Ace and there is a two, a three, and a four on the table pick them ALL up. If you have a seven and there is a seven and a Jack on the table, pick them both up. In the photo below the seven would pick up the seven, Jack and Queen that are on the table. Another combo is to add two cards together that have already been discarded and pick them us with the sum card. 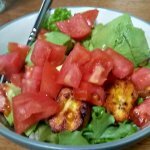 Example: There is a two and a five already on the table. You have a seven, you can pick up the two and five with your seven. You must hold the high card to combine cards in this way. This does not count as a "caida" and you score no points, but again this adds to your total card count. If you are dealt three of a kind in one hand you can call "ronda." But this is a tad bit risky. If the person after you has the fourth card and picks up your "ronda" card you LOSE THE GAME automatically. If no one can get a caida with one of your three of a kind you get two extra points. "Doble ronda" which is four of a kind automatically wins the game. If using matchsticks pick up one for every two points you score. If using only the cards set aside pick up one card FACE UP for every two points. When you get to ten points trade in your ten points for one card FACE DOWN. It may seem a bit complicated, but once you play a couple of rounds you get the hang of it. 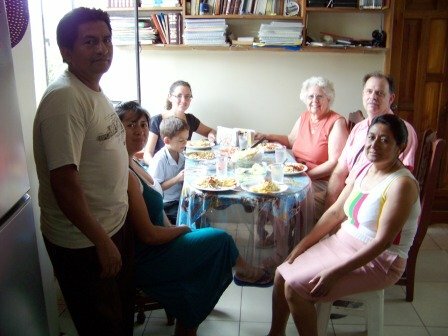 And learning to play Cuarenta is a great way to get to know your Ecuadorian friends better.